I'm selling a used Meinl Weston 2165 6/4 CC tuba. The horn is one of the early models, as it uses the “small valves.” This design feature makes the horn much more agile and easier to control than its “big valve” counterpart. Unlike other CC horns, this tuba has a rich and dark sound. It achieves this timbre with a heavy lacquer-plated body. It is not for the faint of heart to hold. 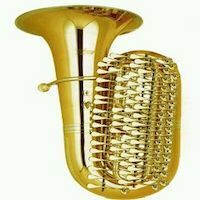 The tuba comes with MAW valves designed specifically for the horn (along with the original valves), an MTS 1209 hard case and two tuning slides that elongate the horn, thereby lowering its pitch to BBb. I purchased this tuba in the fall of 2018. I used it in orchestra and brass quintet, and I even played some contrabass solo repertoire on it. Unfortunately, several unexpectant dental issues came up in the fall that have made playing the tuba for m too painful, so I am taking my musical pursuits in another direction. I’m asking $10,000 for this tuba. This amount does not include shipping via Greyhound from Kingston, NY. Last edited by Tubanomicon on Thu Feb 28, 2019 8:52 pm, edited 4 times in total. I was not aware that MAW valves were available for the "small piston" valveset - do you have any more details about them? I agree with you that I find the "small piston" valveset preferable to the Shrek-sized valves that came later. I worked with Martin to develop the valves specifically. It took several rounds of trial and error, but we got there, and they work great.